I’ve been thinking about my entryway for a long time now. When we first moved in I hung this mirror (that’s in the before picture) on the wall and called it good. 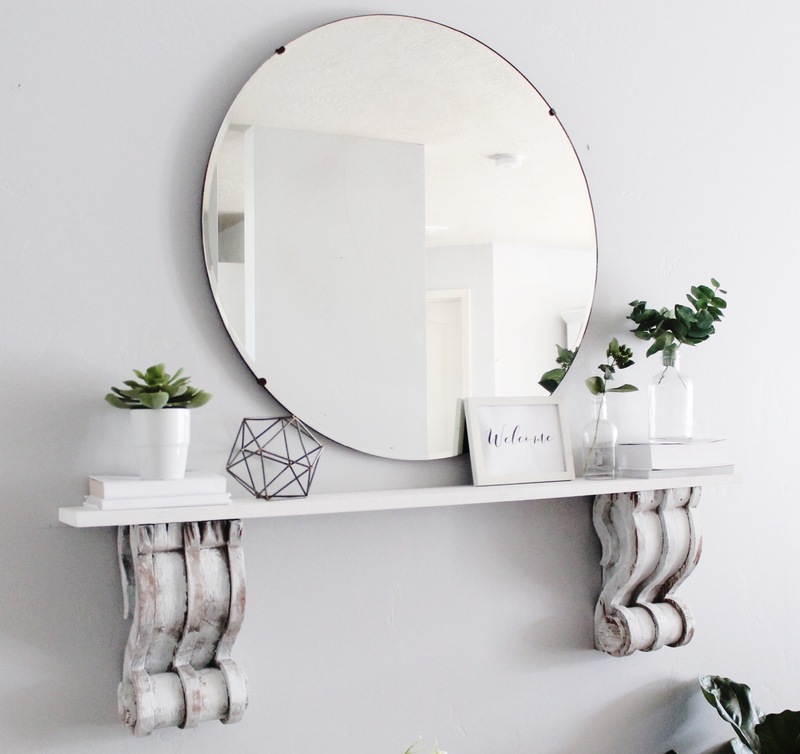 After a year and a half the boring mirror became a little too boring. I wanted to do something a little more exciting and pretty in our entryway. The major problem is that our entryway is so tiny. It’s literally the width of the door with maybe a couple inches on each side. I had to get creative with what I wanted to do with such a little space. 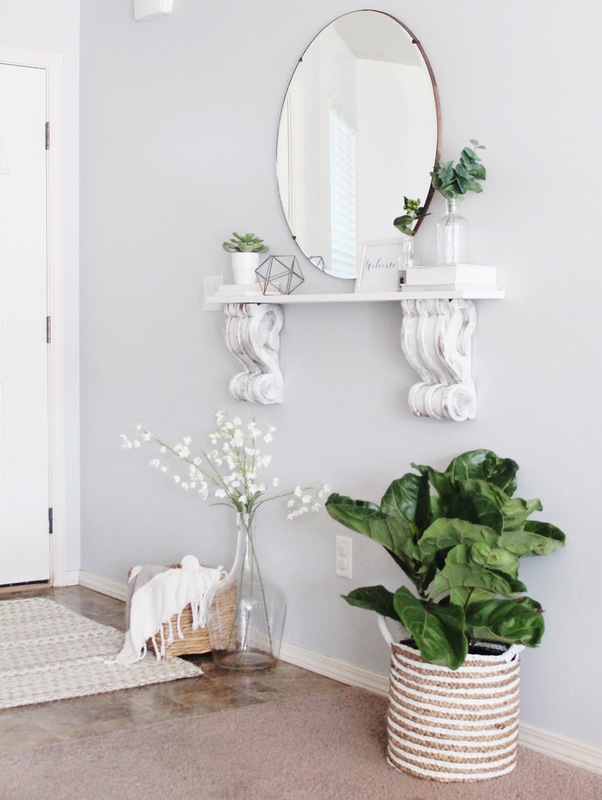 I have searched and searched Pinterest for small entryway ideas and found so many cute ideas, but none that were perfect for our entryway. Finally, this past Monday night I found an idea that I thought would be easy and perfect for our entryway. The idea was to make a small shelf out of old corbels. The next morning I ran to my favorite antique store to see if they had any corbels at a descent price. What do you know, they did! I can’t believe the one and only antique store I went to had exactly what I was looking for. It must have been meant to be. Here are the corbels that I found. I loved the chippy paint on them and the fun design. 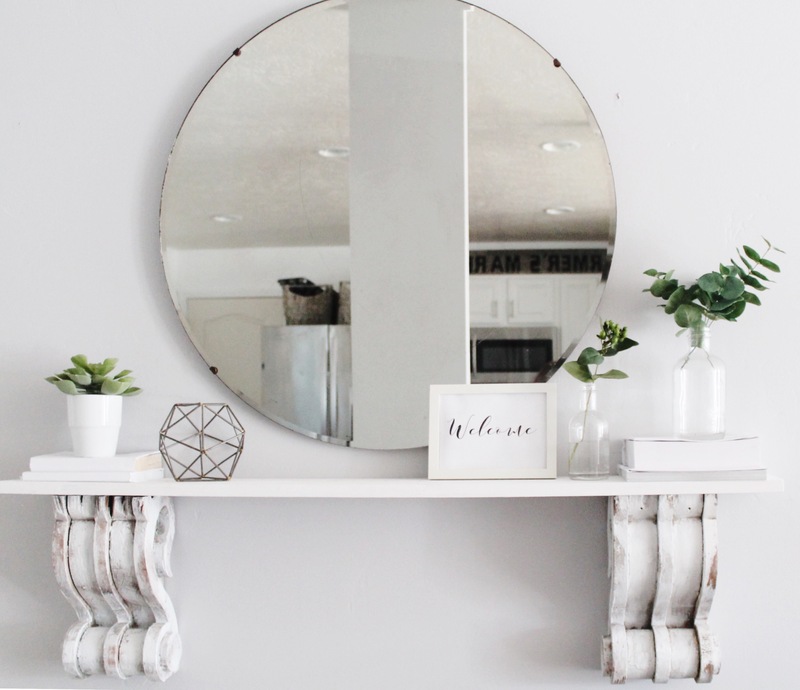 I would say the decor in my house is a modern farmhouse style. I love some modern things and some vintage farmhouse things. 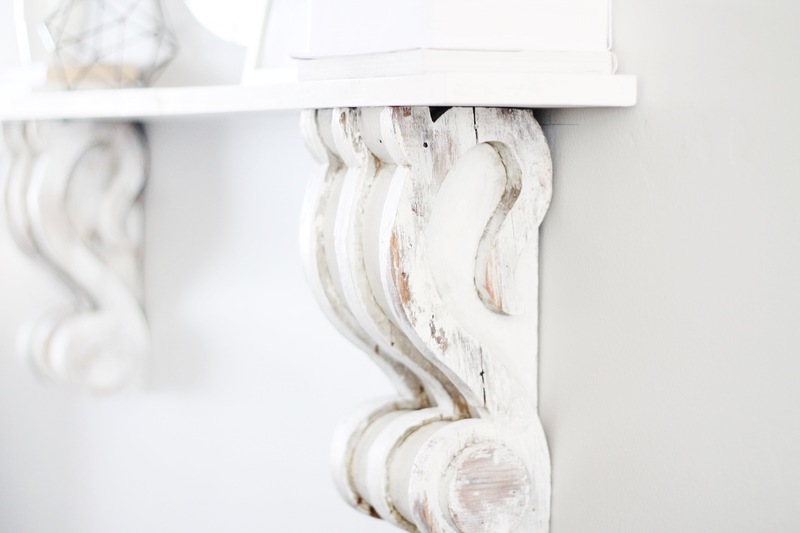 These corbels definitely showed the vintage farmhouse style I am going for. One of the corbels had green chippy paint on it and the other one had white. I LOVED the white one so much but was sad that the other one was green. I wanted them to be uniform so I knew I needed to paint them. I was sad to paint them because I was worried about losing the old chippy paint look to them. I found a technique to keep that old chippy paint look I was going for! Here is how I created this shelf! I started by brushing Vaseline generously on the areas that I didn’t want the new paint to get on. 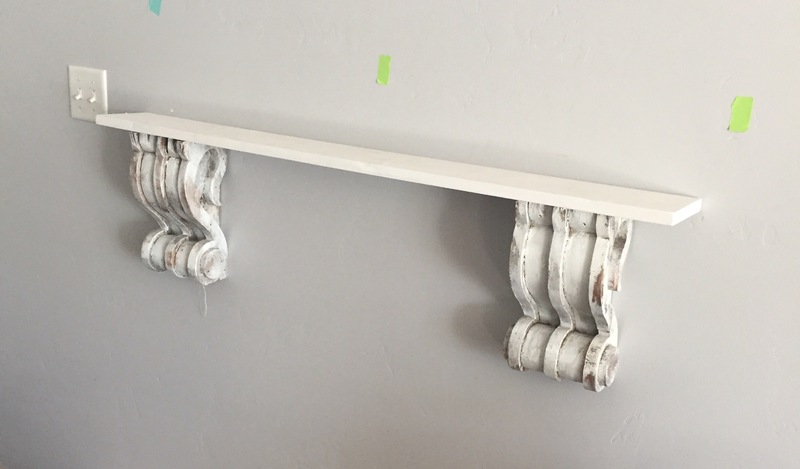 I then lightly brushed white chalk paint onto the corbels. I really tried to go light and let some of the wood still shine through in areas. Once they had the amount of paint that I wanted I let them dry for about thirty minutes. This is what they looked like when I was done painting them. Don’t mind our extremely messy work area. We have been busy busy busy painting furniture. While the corbels were drying I made the shelf that will rest on the corbels. I found a piece of wood that we already had and cut it to four feet. I then sanded the whole thing, including the edges. Once it was sanded I painted it the same white as the corbels. Once the corbels were dry I grabbed a paper towel and gently rubbed the paint off on the areas that I had put vaseline on. You can see in this picture above how the wood is poking through. Those are the spots that I put the vaseline on. They turned out just how I wanted them to! The corbels and shelf were all painted and ready, now I just had to figure out how to hang them on our wall. To hang the corbels on the wall I first needed to find the studs. The corbels are pretty heavy so I wanted to hang them on studs. What do you know, there were no studs in the area that I wanted to hang the shelf. I really didn’t want to move the shelf in a weird spot where the studs were so I found a sturdy way to hang it. I used some plastic anchors. First I had to find the exact spot that I wanted to hang each corbel. What I did was hold up my shelf on the wall at the height that I wanted. I set a level on the shelf and got the shelf level. I then drew a line on the wall with a pencil all the way across the shelf. I then found the spot that I wanted the corbel on and I measured from the edge of the line to the center of the corbel and put a mark on the wall. I did the same thing on the opposite end of the line. I then used a 1/4 inch drill bit and drilled a hole in the sheetrock. I then placed the plastic anchors in the hole that I drilled. I then slowly screwed it into the wall until it was flush with the wall. While trying to figure this part out I did manage to put one big hole in the wall while doing this… I eventually got it right though. I watched a dumb youtube video that told me to pound the plastic anchor in. DO NOT HAMMER IT. hahaha learn from my mistake. Then I screwed in the actual screw into the plastic anchor. I made sure not to screw it all the way in so there was a part that the corbel could hang on. Alright, now we are ready to get the corbels ready to put on the wall. 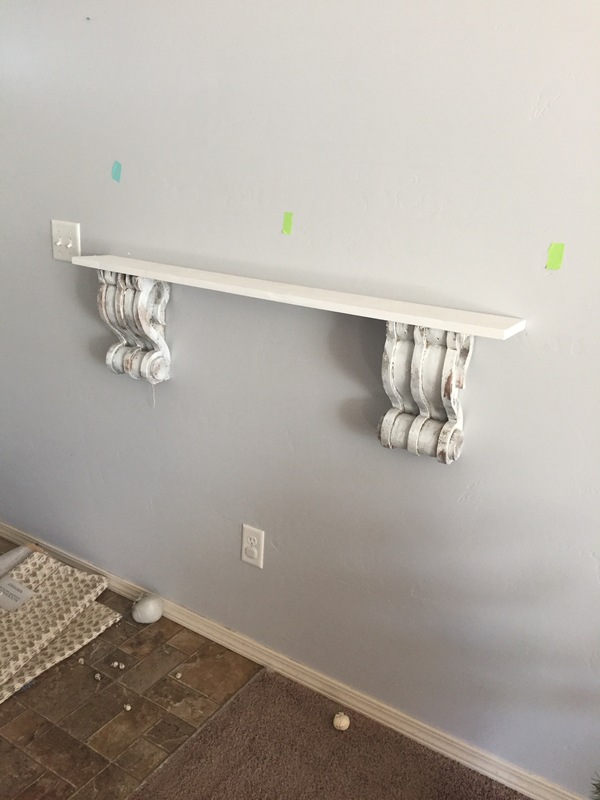 I decided the easiest way to hang these was to add a picture hanger on the back of the corbels. I placed them on the center and marked the holes. I then used the drill bit to create holes in the spots I marked. I placed the hanger back on the corbel and screwed the screws in place. Now it was time to test it out! It worked perfectly!! I then hung both the corbels and placed the shelf on top of them. I didn’t nail or glue the shelf down. All I did was place it on the corbels. Eventually I might attach it for good to the corbels but for now I am fine with having the shelf just rest on it. Now that I had the shelf up I had to figure out how I wanted to style it. I knew I wanted a mirror over it because I love having a mirror by the door. I really didn’t like the mirror that we had in this spot with the new shelf. 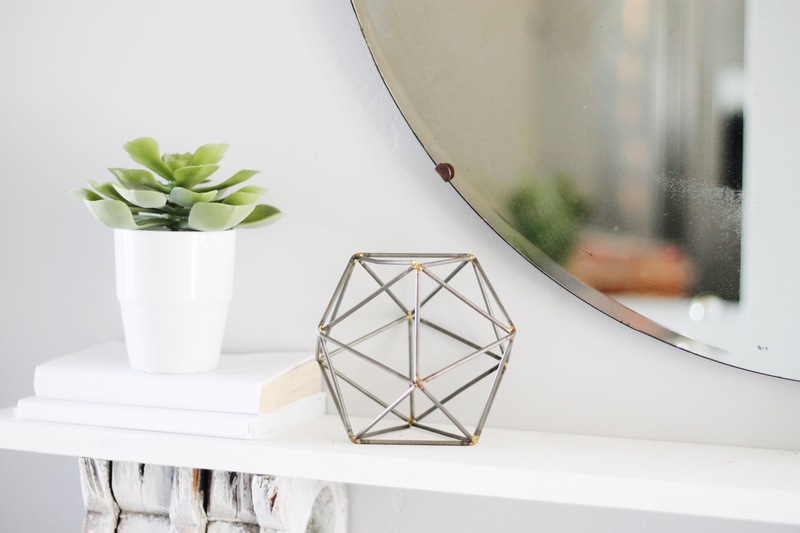 After I had the shelf hung I remembered there was a round mirror at the antique store that would be perfect above the shelf. It was only $39 too! I decided to run back to the antique store and I bought the mirror. It fits perfectly right above the shelf. 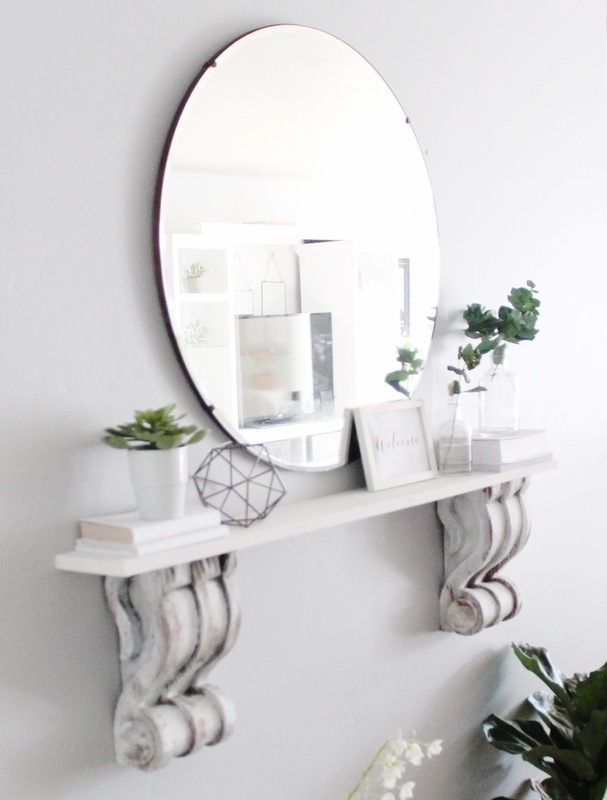 The round shape of the mirror is pretty modern to me, so the modern mirror with the vintage corbels fit with the style of my house perfectly. Modern Farmhouse style right there! Aren’t these corbels beautiful? I love all the details on them and how the white paint turned out. On the shelf I just gathered things I had around the house to style it. 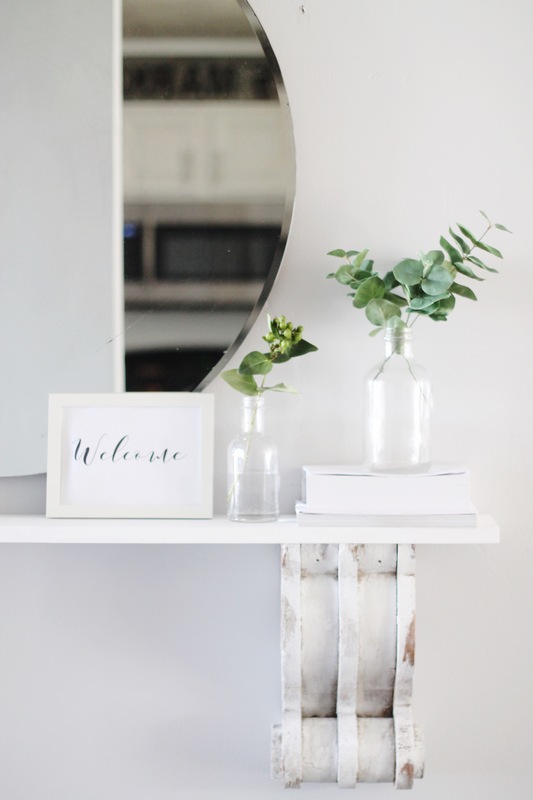 I covered some books that we had with white paper, filled old spice bottles with greenery, and added a framed welcome sign that I quickly made. On the other end of the shelf I added more books, a potted faux succulent and this fun little metal accent. 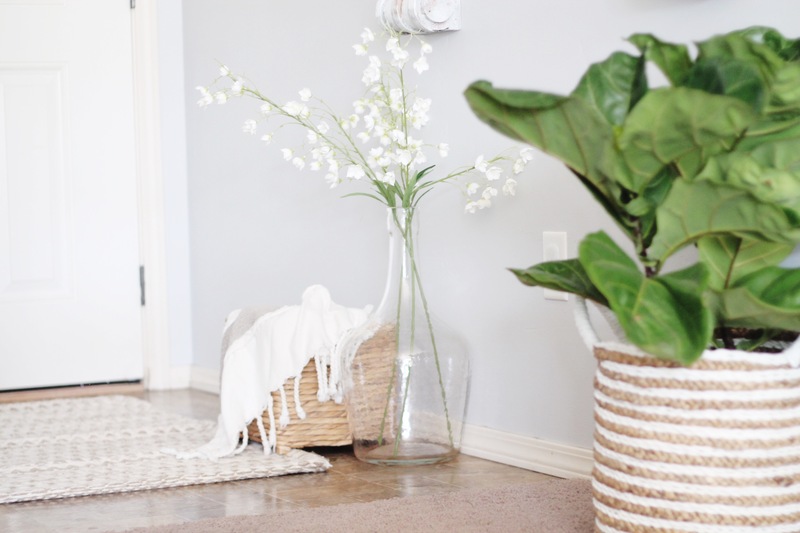 To complete the entryway I added a few baskets, one with a blanket and one with a fig tree. I also added a glass bottle with some white flowers in it. I have never liked the rug we have had in our entryway so I replaced it. 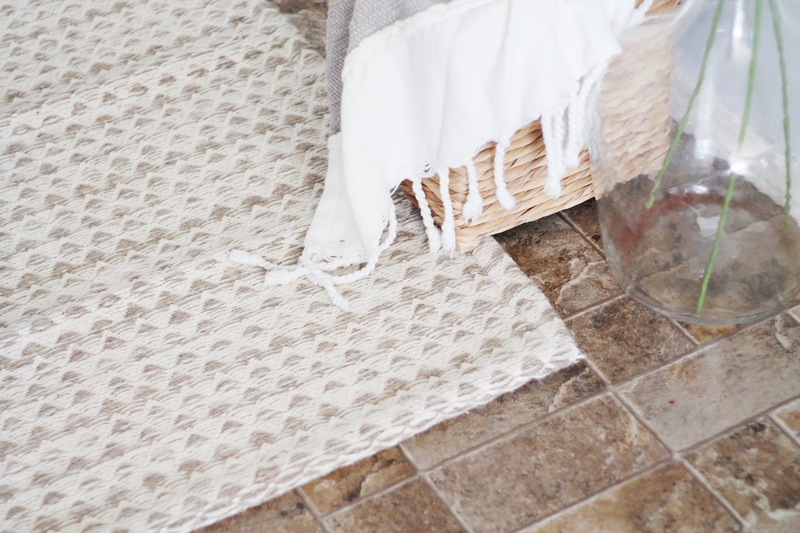 I found this rug at Homegoods for only $14!! Steal of a deal. It is a very heavy duty rug too! Now every time I go in and out of our front door it just makes me smile and I finally feel good about our entryway. I also have styled it for Christmas already 🙈 Stay tuned for pictures of our entryway all decked out for Christmas next week! Let the Christmas decorating begin👏👏👏 I hope you enjoyed the journey of how I made this fun shelf and put it all together. Come stop by next week again! Wow this turned out beautiful! I have to say your pictures are very clear and helpful.